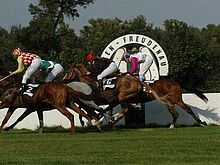 A new equine and fashion event comes to the Freudenau racecourse in the form of Vienna Ascot on 16 and 17 September 2017. Apart from the horse races, visitors will be entertained with fashion shows, food and a music program. 16 September is "Ladies Day". In addition to four races over different distances, the program will include a 'Frühschoppen' (morning pint) from 10.00 am, a fashion show and five o’clock tea. Furthermore - as befits an equine event - a prize will be given for the best ladies hat. Things continue at a brisk gallop at the "Family Race Day" on 17 September. In addition to the Maria Theresa Cup (over 1,000 m in Montur), the Vienna Ascot Ladies Cup will also be held. A full-day children's program and musical entertainment guarantee a varied day at the races.